I get it. Saving money for your future doesn’t seem like that important of an idea, especially when you are in college. And to be honest, it probably wasn’t on my mind much either. I remember thinking that I had my whole life to save for the future and the word retirement didn’t even register as important in my head. When I learned about compound interest, I got a whole new perspective. The idea is simple. Money you save now will grow with interest in the future. Compound interest allows you to grow interest on the money you put in (called your principal) as well as on the interest you are earning. So it exponentially grows your money. However, you get the most bank for your buck by starting now. That’s why it is important to start a budget now for your future. Deciding to budget and save in the early part of college rather than the end can save you thousands of dollars! Even if you are a little bit later in your college career, it is a good idea to put a part of your income away in some sort of savings account (bear in mind that there is a difference between saving and investing, and we would be happy to explain that difference). 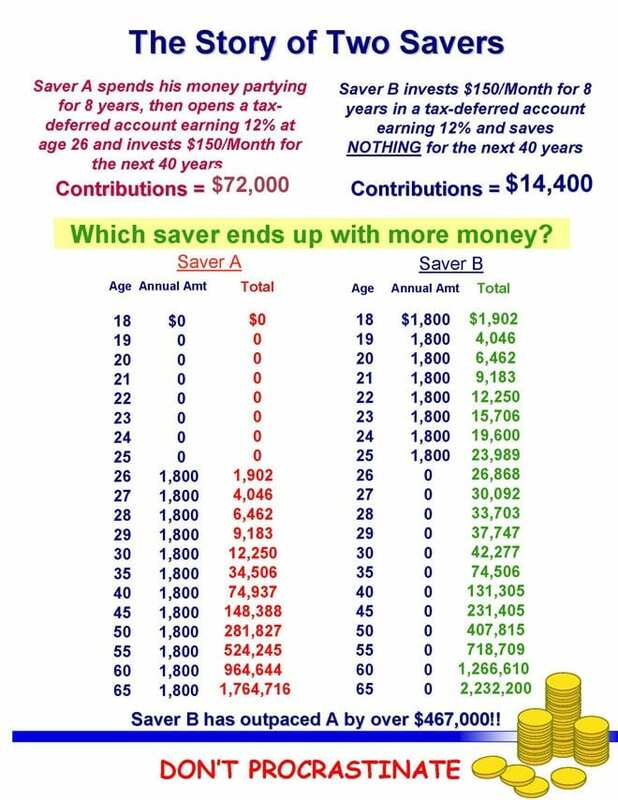 This image (credit: http://www.financiallyfocus.com/story-of-two-savers/) clearly shows the difference between someone who chose to save early rather than later in life. 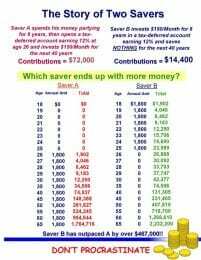 By deciding to save while he was younger, Saver B was able to have over $467,000 more than if he had only started saving later (maybe after graduation). That is the miracle of compound interest. When we borrow money, we have to pay interest on what we borrow (such as when we borrow money for a car, house, or student loans). By saving money, we get paid interest the longer we have it in the account. How much money you get depends on your financial institution’s interest rate and how long you leave the money in the account. Interest either works for you or against you. By choosing to put away a portion of your income away, you are ensuring your financial security for decades to come! It pays to save! You don’t have to save $150/month to get started though. You can come in to Powercat Financial to get a savings plan going as well as learn about other wonderful services we offer. We can help you learn about credit and credit cards, student loans, helping with the transition to work, and where you can find more resources. Make an appointment today and see what your money can do for you!